I have been struggling the past few days with so many emotions. I feel frustrated and lonely and angry and scared. I am holdong on by a thread tonight. But then I read my friend, Sumi's, blog post and I gained a little perspective. 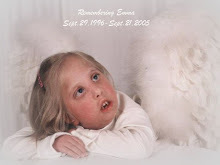 She is remembering her precious Jenna who died a year ago today. Such sweet memories but such incredible pain in the remembering.